Summary: The key to this great basic method is to brown the meatballs, then simmer them in the sauce (in the same pan if possible) to draw out that great flavor into the liquid. 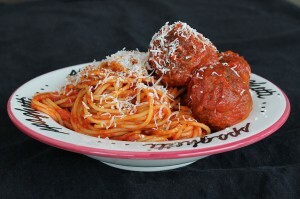 Classic Spaghetti and Meatballs are always a hit with our kids. Mix together the ground beef, eggs, bread crumbs, parsley, salt, pepper, and garlic powder, in a large bowl. Heat the olive oil in a wide heavy-bottomed sauce pan, over medium heat. Form the meat mixture into balls with your hands and place the meatballs in the pan. Turn the meatballs as they cook so they are browned on all sides. Add the marinara sauce to the pan, and scrape the bottom of the pan with a wooden spoon to release browned bits into the sauce. Cover and simmer on low for at least 15 minutes or up to an hour, adding water if the sauce becomes too thick. Heat a large pot of water to a rolling boil over high heat. Add one tablespoon of salt to the water, then add the noodles. Return the pot to a boil, then reduce heat and simmer. Cook the noodles until they are just slightly firm to the bite, about 9 minutes. Toss the spaghetti with the sauce and meatballs, and serve topped with parmesan cheese, with bread on the side. 1 Pings/Trackbacks for "Classic Spaghetti and Meatballs"